Marvel and DC are the two titans of the comic book industry and have been going head to head for decades. It’s been made pretty clear over the past few years that DC was never going to catch up to Marvel on the film front. Marvel had the better start, a proper build up and a clear vision. DC, not so much. As Jor-El said in DC’s first attempt at an expanded universe of films, Man of Steel “They’ll race behind you, they will stumble, they will fall, but in time, they will join you in the sun Kal.” After the stumble and fall of Batman v. Superman, and Justice League we’ve seen DC come around in both Wonder Woman, and last year’s Aquaman. Will the latest film Shazam! be the one to push them out of Marvel’s shadow and into the sun? Billy Batson (Asher Angel) is going through a rotating door of foster homes while he continues to search for his mother who he was separated from as a child. He is placed with a new family of foster kids including Freddie Freeman, when he stands up for Freddie at school he gets in a situation where he encounters a mysterious wizard (Djimon Hounsou). The wizard has Billy speak his name Shazam, and Billy (now Zachary Levi) is transformed into a grown-up superhero version of himself, red tights, a cape, and everything. In his new form but still with the mind of a young boy, Billy seeks the help of Freddie who is obsessed with heroes like Batman, Superman, and Aquaman. Together they create Youtube sensation with a test of Billy’s new powers, and not so much heroics, but juvenile attempts at popularity. All the while Billy’s new alter ego is being trailed by Dr. Thaddeus Sivana (Mark Strong) who has been searching for the power of Shazam for years but has uncovered a dark power in the process that allows him to become a formidable foe to the new hero. 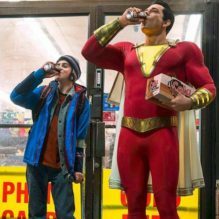 From the opening Warner Bros. logo and a few notes of Benjamin Wallfisch’s score brings Shazam! into a Harry Potter vibe for the younger audience and the filmmakers lead by director David F. Sandberg are clearly using the late Penny Marshall’s classic 1988 hit Big as inspiration for the older generation. But most importantly, they rely on the Geoff Johns modern comic book version of Shazam as a jumping off point. What make this film work is much like in the trailer they lean heavily on the humor. In fact the majority of the movie is gags and poking fun at the super hero mythos. Most work really well. Mixed in is a bit of heavy handed, by-the-numbers ‘the importance of families’ message, which varies in degrees of success. But most of all, what this DC film has that most of the others that came before lacked is a level of fun and sheer entertainment. True, it’s almost an easy win, going kid wish fullfilment as a central theme, but they stick the landing as by the end of the film I was super invested in the characters and wanted to see more of this great entry into the DC universe. If they intend to keep up with Marvel, this is what they need to continue to do. Make really entertaining films where these classic characters dictate the tone of the films they appear in, which if the latest Joker trailer is any indication, they are indeed on their way into the sun, turns out they just needed a jolt of magic lightning.